Polyphemus' at upper left'can hardly be distinguished from his surroundings, almost disappearing into it Nereids and a number of mythical fish may be seen in front of the ship's bow. These figures, too, cannot be clearly distinguished from their background. The effect of their transparent forms is as if they were woven from the foam, the sparkle and the reflections of the water's surface, half-figure, half-glittering wavecrest. But what I suspect most caught Moran's eye is that Turner has managed to compose this picture so as to create the same rotating, energizing movement of the spectator's eye without the heavy-handed visual metaphor of the Hannibal picture. As the composition study shows above, the eye travels around a 'diamond shape,' starting from Ulysses' ship, following a diagonal downwards past the rising sun to the sea, up along the sail of another ship, then bouncing off the edge of the canvas and running up along the gold-flecked clouds, finally dipping downward past Polyphemus on the hilltop, half-obscured with mist, and down to the dark note of the Cyclops' deadly cave. In doing so, the composition incorporates the not-very-visible protagonists into the larger pattern of the landscape about them, underlining the theme of the picture: that human nature is merely one part of the dynamic 'natural order.' The same energies that drive the tiny human Ulysses also drive the huge monster Polyphemus, while the thrust of the hero's escaping ship echoes the rising sun. 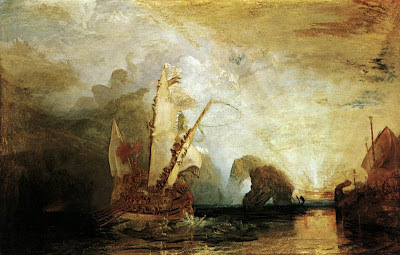 Moreover, while Turner presents us with a glorious, golden-toned landscape as the setting in which an adrenalin-drunk Ulysses stupidly forgets himself and blabs his name, the painter does so to remind us that Nature, even when it presents itself as benevolent, hides a threatening power that will ultimately humble the pride of even the most heroic of men. Thomas Allen - Magical book art photography.